First, happy and excited, then a bit nervous and surprised we're making such a big change, then thoughful and a bit melancholy about all that we're leaving behind in the Twin Cities (such as, family, friends, pizza delivery, Chipotle, ...). You read that right -- no pizza delivery. We've found a house outside of Menomonie (yes, we have some very happy grandparents : ) and it's far enough out that we need to figure out how to get some basic services that we've grown accustomed to, being the city folk we are. The trade off is a great home surrounded by trees and nature. I'm going to remain at my job at Gillette Children's in St. Paul and have been lucky enough to work out a schedule of working three long days. This will allow me to spend even more time with Gracie, which is the biggest plus of all. This long holiday weekend was eventful for the Edenborg family. It started off with the first night we spend without Gracie. Grandma Patti volunteered to have a sleepover with her. So this weekend we took her up on it and headed to a B&B in Wisconsin. I'm not going to deny it -- it was so nice to get 8 hours of sleep and not have one ear open to hear any peeps or whimpers. It was great to see her little face when we returned on Saturday. 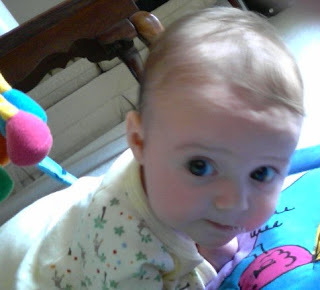 That evening when we put her to bed around 8:30 p.m., we were prepared to return to small batches of sleep. When we woke at 6 a.m. the next morning Jay asked me how many times I'd gotten up to feed her. My answer: "None." She'd more than slept through the night. We called Grandma Patti and asked what drugs she'd given our daughter and could we have some more : ) We thought it might have been just a fluke, but then Sunday night she more than slept through the night again. I hope this is a new sleep stage, but I'm also aware that it could just be a blip. In an earlier post I'd mentioned Grace chatting with a lotion bottle. I recorded that for your viewing pleasure. The visual is a bit dark, but you can hear how into the conversation she gets. Maybe she's telling the lotion bottle how excited she is about becoming a Wisconsin girl. More on that in my next post. Grace (and I) did great with the first week of day care. We have a great in-home provider who really eased our minds about this transition. She updates us on how the day went and told us that Grace loves watching the other kids. I imagine they do much more interesting stuff than us adults. My days at work were good too. I wore real clothes (not comfy pants or hooded sweatshirst) and real shoes (not slippers or footie socks). I had real conversations (by "real" I mean conversations with words : ) And I really looked forward to picking Gracie up. Now we put her to bed between in the early evening, so we make the most of the time we have with her when we get home. On Friday Gracie surprised us by holding her head up (see photo). Grace is only in day care four days a week, but it's still quite the adjustment. I'm so used to being with her all day that it was weird to not be. I remember three months ago it freaked me out to think I'd be caring for this new being all day and all night, and now that I'm no longer doing that ... it's different. Not good, not bad, just different. Gracie's a thoughtful daughter. She got me a Mother's Day card and told her dad to get me flowers -- a great first Mom's Day. (It was also great on a different level because I was able to get my favorite pair of pre-pregnancy jeans on!) The day was the pe rfect end to a week where Gracie and I learned a lot. She learned that naps are a good thing and I learned how to get her to take them relatively painlessly. If only I'd mastered this before the last week of my maternity leave ... Yes, tomorrow I'm taking Grace to day care for half of the day so she can get a feel for the new routine. Who am I kidding? It's so I can get used to the new routine. It'll be good for her to see new faces and places. Lately it's been so fun to watch her. Even when she's just sitting in her swing looking at the toys in front of her you can almost hear the gears turning in her head, processing all the new things she is learning. On a lighter note, Gracie's been chatting so much lately, testing out different sounds on anyone and anything that will "listen" -- today she had a 10 minute conversation with the lotion bottle on her changing table. Giraffe and Snoopy must not be very good listeners anymore. And in other big news ... Grace is three months old today! Happy day! And that means that Mom is going back to work next week. Not-so-happy day. I'm sure once I'm back into my work routine it'll be OK, but it hit me this morning that this is my last day like this with Gracie. While I will often have Fridays off, it'll be different. My first lesson in letting go. I'm all about learning, but these types of lessons aren't much fun. The weather's warmer (at least for today), Gracie's growing like a weed (and a cute weed at that : ), and we were going to do some visiting today (congrats Valerie on your Minnesota twins!) so I thought we'd put her in some non-sleeper style clothes. She has quite the array to chose from: dresses, overalls, capris, t-shirts, pants, tunic tops and your traditional onsies. (Not to mention a windbreaker jacket and a hooded sweatshirt that I can't wait to get on her : ) This not quite three-month-old has been into three to six month clothes for the past few weeks due to her long legs so I knew we may miss the window on some cute outfits if we didn't start dressing her up soon. I made today's outfit selection based on what I thought she was the closest to growing out of. I think we got this one just in time. This cute flowery little pink number fits her just about right today, tomorrow could be a different story. This may just be Gracie's own private fashion week! The top photo shows her contemplating her cuteness: "Hey, I look darn spiffy in pants. Now let me leave a puddle of drool on this cute pink top." In this bottom photo Gracie lookes like she was just caught doing something by the paparazzi: "No, I'm not baring my midriff! I'm just trying to locate my belly button. Now where did that darn thing go ..."
This is a tale of two diapers. 1:30 a.m. Awakened by a wimpering Gracie I made my way to her crib and started to unswaddle and change her. We have this handy blanket called the "Miracle Blanket" -- I kid you not -- that keeps her from flailing during the night. It's handy for that purpose, but not so handy when you'd like to make a smooth, uneventful diaper change. While I attempted to cut corners and just half unswaddle her during the change, she decided to do some extra tinkling after I removed her soiled diaper. Sure enough, her gown and a corner of her blanket were wet. We only have one of these miraculous blankets (at $30 a pop, we couldn't justify getting two) and hadn't discussed what the protocol should be when it became soiled. Since it was an outer corner that was damp I decided to swaddle her back up in it. During this entire process, Grace only screeched a little. Plus, I got her changed and reswaddled in record time and in dim lighting nonetheless. I almost woke Jay up to tell him about my accomplishment ... almost. 8 a.m. The fullest diaper I've ever seen. And from a smiling baby who didn't soil her clothes nonetheless! Think she was proud of what she produced.